The last full solar eclipse of the 20th century in this hemisphere was about to take place. I had come to Peru with my friend Beth to witness that event. As I went to bed our first night in Cuzco, I wondered uneasily, "What am I really doing here?" That night a powerful dream gripped me. In it, I was in my California home when an old woman rang the doorbell. As I opened the door, she said, "Your husband was my grand-daughter's doctor. His work was unsuccessful, and she is dying. I've taken your husband prisoner, and when you come with me, I'll release him." As we entered her home, she released my husband, but ushered me into a room where seven bewildered people were milling about, and then she went down a hall. Finally, I followed, and found her in a bedroom, focused on a child who lay comatose in bed. The woman paid no attention to me, but was fully alert toward the child. I immediately understood that I had come to bear witness to the transformation of the child's life. And I had come to Peru to begin to witness the transformation of life as we know it on the planet. Shamanism, feminist spirituality, and mindfulness meditation have been powerful guides through my life's terrain for over twenty years. The Stone Dancers, an amazing women's circle, continues a twenty-year history of exploring feminist spirituality through myth and ritual, through trance journeys and art, and through community involvement in numerous issues of social justice and the environment. This circle sustains me on my journey, and its dancers have accompanied me on many of the journeys described in Circling the Bay. 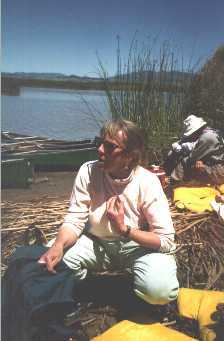 Ginny Anderson holds a Ph.D. in psychology from Stanford University. She's counseled and taught at U.C. Davis, at Stanford, and at the Institute for Transpersonal Psychology. She maintains a private practice in Atherton, California. Ginny shares these experiences, principles and practices in a number of ways. She organizes community rituals for Earth Day, and for Winter and Summer Solstices. She honors and explores human connections with water through community celebration, Soul Collage, story-telling, and canoe journeys at sources that feed San Francisco Bay. She participates in fire ceremonies celebrating full moons. She serves on the Board of Directors of San Bruno Mountain Watch, and of the Center for Aging and Spirituality. She contributes to SageWoman and PanGaia, and to the Proceedings of the International Conference on the Study of Shamanism. When issues of personal importance come up for herself or for others, or community needs become apparent, her response comes from this vast well of experience.